Supplements are a great way for you to enhance your health. Each different supplement has their own benefits so you should be aware of what these supplements are before you take any. This is everything that you need to know about chaga mushrooms and what they can do for you. 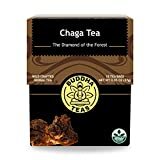 Chaga Tea - Powerful Antioxidants, Wild Harvested, Caffeine-Free - 18 Bleach-Free Te..
Chaga mushrooms are a highly concentrated mass of mycelium. The exterior of the chaga is dark and cracked, almost like a chunk of charcoal, while the inside is a yellowish-brown color. Chaga mushrooms are anon-toxic mushroom that has long been used in the East for centuries. Typically used as a tea, it was consumed as because of its widely known health benefits. In recent years, it has become increasingly popular in the West for these same health benefits. Interestingly, this mushroom comes from birch trees that are infected with a parasitic fungus called “Inonotus Obliquus”. This fungus is non-toxic and can also infect other trees in addition to just birch trees. It is most often found in birch forests across the globe but especially Russia, Korea, Japan, Northern Europe, and various other regions. Chaga mushrooms grow by causing a white “heart rot” to form in its host tree. The spores of the chaga mushroom will then enter the tree through these wounds that can appear on the tree including any very poorly healed branches. The chaga spores will continue to cause the tree to decay from the inside. The masses will continue to grow until the tree has died. In Russia, the chaga mushroom is a traditional folk medicine treatment for many health concerns including as a cancer therapy. It was even featured in the novel “Cancer Ward” by Aleksandr Solzhenitsyn. There is a lot of medical research currently ongoing about its folk uses in medicine. These are the 6 primary nutrients that are found in chaga mushrooms. These are just some of the many health benefits of using chaga mushrooms. Interacts with insulin medicines, potentially raising your risk of hypoglycemia. It may enhance the effects of certain anticoagulant medicines like warfarin and aspirin, leading to a bleeding risk. As with any other medicine or supplement, you should discuss taking chaga mushrooms with your doctor.